Sheep barns at the Experiment Station in Rambouillet, France. The Rambouillet had its origin among the Moors of North Africa during the Fourteenth Century. Distant ancestors of today's Rambouillet accompanied Moorish conquerors to Spain, and their descendants were left behind when the Spaniards drove the invaders out. Spain's resulting Merinos were a valuable legacy of that otherwise unhappy period, along with Europe's first true horse culture. Both were jealously guarded. The quality of Merino wool allowed the Spaniards to dominate the European wool trade, and to maintain that dominance the government strictly forbade export of the precious breed. Spain did export much of its raw wool clip, however, for lack of sufficient processing capacity. Neighboring France was a major buyer and became heavily dependent upon a stable supply to keep its own mills in operation. By the mid-eighteenth century, the French began to fear that increasing Spanish industrialization might lead to an embargo on Merino wool as well as Merino sheep. That concern and the desire to develop domestic production to offset it may have played a large part in Louis XVI's establishment of the experimental farm at his Rambouillet estate. The farm was advertised as a place where examples of the choicest plants and animals from around the world would be studied. High on the list, if it could be obtained, was the Spanish Merino. If such flattery was a ploy, it worked where direct entreaties had failed. As a gift to his cousin Louis, the King of Spain ordered that a small flock representing the finest strains of Merinos be released for export to the Rambouillet farm. A total of 318 ewes, 41 rams and 7 wethers arrived at Rambouillet on October 12, 1786. 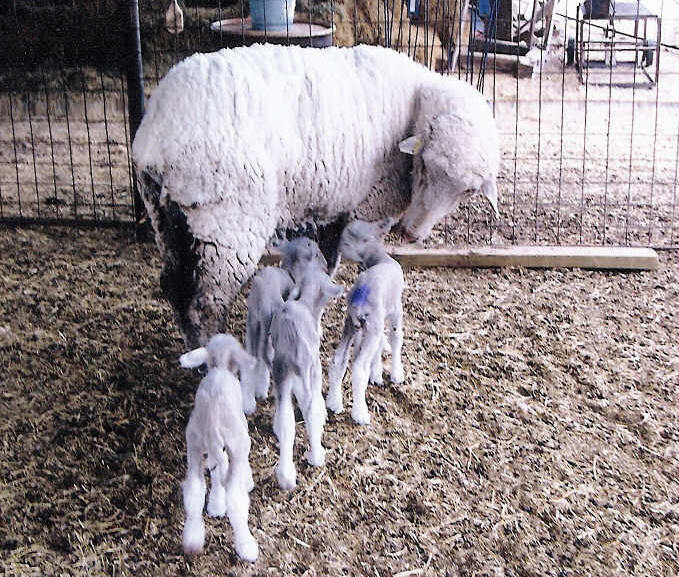 It was the first significant release of Merinos to the outside world and except for one small addition provided the sole basis of the eventual Rambouillet breed. Within the next few years the Spanish empire began to crumble and Merinos found their way throughout the globe, mixing and mingling with various other breeds and types. The strain assembled at Rambouillet remained unusually pure, however, even through the tumult of the French Revolution when their owner lost both the throne and his head. Parceled out to a handful of dedicated caretakers, the Rambouillet Merinos not only maintained their superior fine-wool characteristics but also developed a body size and confirmation seldom seen outside the mutton breeds. By the mid-1800s a few American breeders had begun importing Rambouillet rams to cross onto domestic flocks, primarily the by-then common and somewhat deteriorated Merinos. A select group of American sheepmen, however, attempted to emulate the small clique of Europeans who maintained pure Rambouillet stock. This led to a split between the Purists and those who attempted to graft the Rambouillet name on a cross bred offering. The culmination of that rift was the 1889 meeting that produced the Rambouillet Association. A tract in an early edition of the annual American Rambouillet Record elaborated in some detail on the concerns that brought the association into existence. Its anonymous author wrote that "most" of the early importations of Rambouillet rams into America were used to increase fleece bulk on existing Merinos and to improve their "size, vigor and constitution". Unfortunately, he continued, this tended to reduce total fleece weight, which in the more common Merinos was often a result of excessive grease. In response, many breeders shifted selection toward "the greatest possible weight of fleece in proportion to the weight of carcass, regardless of the proportion of scoured wool to the raw material". In short, they bred the grease back into the point where it formed "a black crust on the surface of the wool". They also sacrificed frame size in the process, returning nearer and nearer to the common Merino while retaining the Rambouillet name. This practice was aided and abetted by the Civil War, when demand for wool soared and buyers were unable to discriminate against heavy-shrinking clips. Consequently, the Record explained, "nearly all of the pure races of the French Merino disappeared", jeopardizing not only the wool attributes that had been bred into them, but their near mutton-breed carcasses as well. It was to preserve those dwindling numbers of pure Rambouillet that the Association was formed. It became permanent with its 1890 meeting, and soon afterward began publishing the Record. The first issue lists Grinnell as president; L. B. Townsend of Vancouver, Washington, vice-president; L. G. Townsend of lonia, Michigan, as treasurer; and Samuel D. Pierson of lonia as secretary. By 1892, L. B. Townsend was shown to reside in lonia, Michigan, along with L. B. Townsend, so all of the group's original members were essentially Michigan men, as were the two directors who did not otherwise serve as officers. In addition to the six officers and directors, the Association appointed a judge whose task it was to "rigidly examine every flock and reject any and all sheep or flocks regarding which there was the slightest doubt as to purity of race". The first Record includes only six flocks which survived the cut. "Some flocks were entirely rejected and permanently excluded from record," the publication stated with finality. Sheep which qualified for registration were to be permanently identified "by means of metal ear-tags", with name and number stamped thereon. Today, the association is located in Levelland, Texas and the registry has been out-sourced to Kansas. All pertinent past records have been moved to a climate controlled building on the campus of Angelo State University in San Angelo Texas. Records dating back to 1893 are encased to preserve our history. Face free from wool around and under eyes to insure good vision, and large nostrils, lips thick and pink. Eyes large clear, alert and well set, eyelashes light in color. Ears medium in length and free from excessive pigmentation. Rams – Strongly masculine and bold, medium length, wide between the eyes and ears. Horns – well developed with wide spirals to prevent crowding neck and jaw.Polled – free from scurs. Ewes – distinctly feminine and refined. Free from folds, medium length, blending neatly into moderate well rounded shoulders that are not open, sharp, or prominent. Chest – Broad, deep and full. Back & Loin – Strong, straight and broad. Long in length with a long, wide loin and a thick, natural flesh covering throughout. Ribs – Well sprung, wide, and deep, with a full heart girth assuring good capacity for vital organs. Rump – Long level and wide, carrying width well out to dock. Dock free of skin folds. Leg – Thickly muscled. Well filled out with deep twist; free from folds. Feet & Legs – Straight and strong, with good bone for age. Medium in length and set squarely on the corners, free from colored hair. Pasterns strong and up-right; hooves amber colored and free from excess pigmentation. Should move freely. General Appearance – Stylish, alert, active, and well-balanced showing distinct RAMBOUILLET characteristics. Well developed for age. Deep and wide bodies, with a straight top and underlines, showing desirable body confirmation. General Appearance & Condition – Attractive, bright, uniform, dense fleece of high yielding, long staple, fine wool. Cream to white in color. Free from objectionable fibers. Bright and healthy pink skin. Forehead covered, but not wooled sufficiently around eyes to obstruct vision. 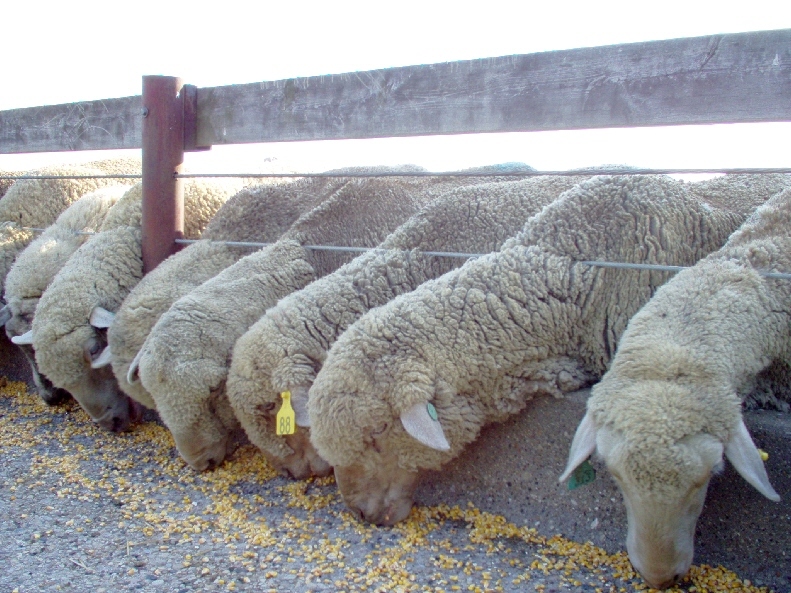 Length of staple – Sheep in good condition should produce a minimum of 4 ½ inches for 12 months of growth. Density – The fleece should be as dense as possible (Maximum number of fibers per square inch of body surface.) Belly well covered and minimum bare areas in the flanks and armpits. Density, staple length, and body surface largely determines amount of clean wool. A large amount of skin exposed when fleece is parted indicated a lack of density. Fineness & Character – Should be uniform in grade over body. Well defined, uniform, sharp crimp from base to top and uniform over whole body. Bulky, soft, and pliable to the touch also sound throughout. Free of kinks and objectionable fibers. Abnormal development of testicles or only one testicle descended in the scrotum.Unsound udder or inverted teats.Overshot or undershot jaw.Black spot in the fleece.Rolled under eyelids. Weak pasterns. Black spot on any portion of the sheep.Wool blindness.Scurs on polled rams.Neck or body folds.Medial folds on rump or britch.Kemp or other undesirable fibers.Close horns that pinch the neck or jaws.Any defect that may limit usefulness. The Rambouillet is known for its superior, long staple, dense, fine wool. But, what does this mean to the producer? A light-shrinking staple of three inches or better results in greater thread length hence more thread produced per pound of wool. Fine wool means the threads are thinner and finer, again resulting in a higher thread count. Put the two together and an ewe's wool produces a premium price on the market. The average ewe will shear about ten pounds or more of wool each year. This wool is used in finer, worsted fabrics and choice scarves. Some breeders just prefer Horned rams over Polled rams. No matter what purpose the ram is used for, there is no difference in performance on tests - in the show ring, or in the flock. 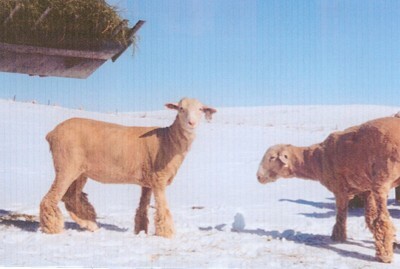 Big, hardy and vigorous; Great adaptability to hot and cold climates, and a variety of forage conditions;Will travel long distances to forage; Good gains on grass; Excellent foundation on a crossbreeding program;Ewes are prolific; Good milkers with strong maternal instinct; Excellent wool production; Superior out-of-season breeders suitable for an accelerated lambing program; Known as the "Dual Purpose" breed with excellent fleece and weight gains; Ewes have less lambing difficulties with less death of offspring and ewe as a result. Well developed flocking instinct to band together in open areas Easy to handle in yards, chutes and sorting facilities Resistance to internal parasites and disease Grazing animals needing minimal labor. This equals less input of labor and capital, less health expenses resulting in more profits! Mature rams weigh about 250-300 lbs. 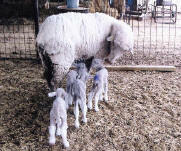 Mature ewes weigh about 200-275 lbs. Lifespan can be upwards of 10-12 years*. The average ewe will have 1-2 lambs per birth* The average ewe may lamb more than once per year* Mature ewe fleece will weigh 8 to 18 lbs. with a yield of 35-55% . * These results occur if under a carefully planned management program. To assure breeders of their Rambouillet ram's performance, an annual central performance test has been continued at the Sonora Station in Sonora, Texas since 1948. This and other test stations across the U.S. show the superior genetic performance of Rambouillet stock.